Home ice cream How To Make Easy Homemade Fruit Ice Cream Recipe? 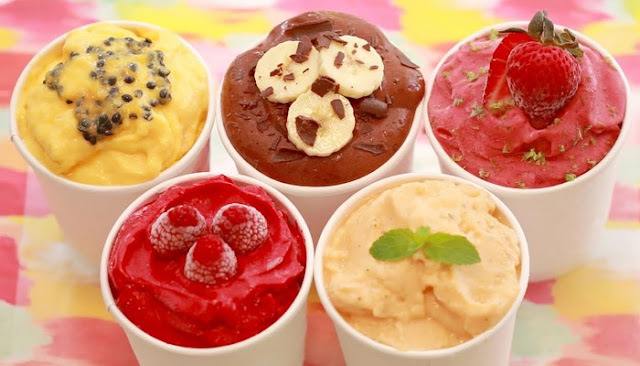 How To Make Easy Homemade Fruit Ice Cream Recipe? One of our family's favorite summer treatments is my mother's famous homemade ice cream! It is the perfect refreshing treatment during the summer days of the dog, and also gives you the chance to highlight the delicious ripe fruit that is rich this season. My family likes to use fresh strawberries in this recipe, but you can use peaches, raspberries, blackberries or other favorite fruits of your family! So, without further delays, here is my mother's recipe for "Foolproof Homemade Ice Cream" for your summer treat! Puree the berries or peeled and sliced peaches with a potato cutting board or process them in your blender or kitchen utensils. Process until you get a consistency that you like. I find my pieces of fruit a bit bigger, so I do not process them too much. So when I eat it, I get frozen fruit in my ice cream. Believe me, it is heavenly! Add all the ingredients to your refrigerator and shake them! I usually use our larger gallon freezer and for this I make a complete batch as described above. 35.00 or less, and it is very easy to use. All you have to do is assemble the freezer (with the ice cream mixture in the container), insert it so that it starts spinning and then put the ice and rock salt on it. Keep adding ice if necessary until the freezer stops rotating. This means that the ice is sufficiently frozen. This is such a simple recipe and, unless an unforeseen catastrophe occurs, it really cannot be ruined. Leave the ice on the ice maker until it is served. Then serve, preferably with a homemade Snicker doodle biscuit. What is your favorite summer treatment? The homemade ice cream from my mother is the perfect refreshment during the summer days of the dog, giving you the opportunity to highlight the delicious, ripe fruits that this time of the year is rich! Puree the berries or peeled and sliced peaches with a potato cutting board or process them in your blender or kitchen utensils. Process until you get a consistency that you like. Add all ingredients to your ice cream maker and shake! Store in a 1-gallon freezer. Make half a batch if your freezer is less than a gallon. Thank you for reading and until the next time! Collect all ingredients. Cut the pineapple and store the juice. Press fresh oranges to make juice (or use the orange juice that you have bought in the store). Diced pineapple and nectarines and slices of kiwi and strawberries. Put the fruits in shape / cups and add the liquids, with half a centimeter on top. Wrap each shape / cup with a plastic wrap. Cut the plastic packaging onto the molds with scissors and add craft sticks in every shape / cup. Place in the freezer for a few hours until it is firm. To remove the pallets, from the molds / cups, let them run with hot water until they dissolve easily. Adjust the number of fruits as desired. I use these ice forms and paper cups Tovolo Groovy. 1. Place the fiber in a cheesecloth and pour off; Add this to the water filtered through the sieve. When it is cold, add the condensed milk and freeze. This will serve eight people. 2. Put water, chocolate, sugar and cinnamon in a pan; Stir until it boils. 3. Remove from the heat, add vanilla and condensed milk. This will serve six people. 4. Place the chocolate, sugar, water and cinnamon in a saucepan over medium heat. Stir until the mixture boils. 5. Remove from heat and add all remaining ingredients. This will serve eight people. 6. Add the sugar to the hot coffee and stir until it dissolves; Add the milk and use enough water to rinse the cans. Add the vanilla. 7. If the mixture is cold, freezes, quickly turn to the end of the freezing point. This will serve four people. 8. Place the sugar, water and peach granules over medium heat; Stir until the sugar dissolves and boil for three minutes. 9. Finely chop the peaches and press them through a sieve and add the strained syrup.